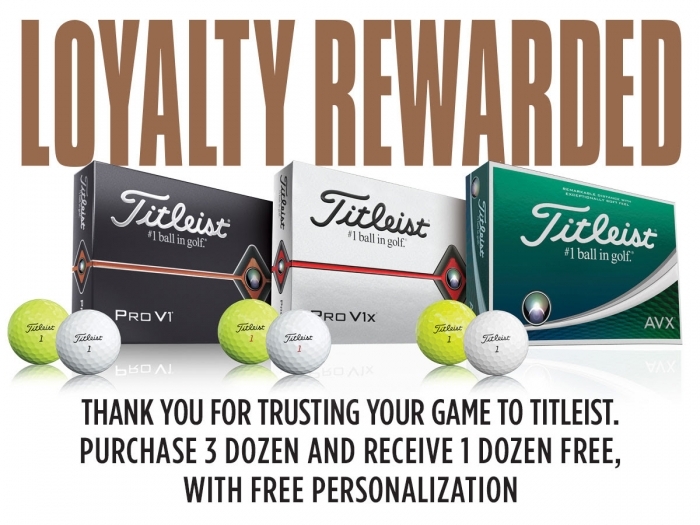 Stock up for 2109 with the #1 ball in golf at the best price of the season. Orders will be taken immediately, and shipped within 4 weeks. Personalization and shipping right to your home is included. Available in Pro V1, Pro V1X and AVX. White or yellow. Sale starts March 22 and lasts through April 22. Pay for 3 dozen at normal price $52.00 (plus tax) and received the 4th dozen free - $164.58 total price. $1.00 per dozen extra charge for play numbers 00, 1 - 99. All the balls have to be the same number. Example you can have them all 7s or all 50s. You cannot get 2 dozen of a number and another 2 dozen of a different number. When ordering online please list your preferences as outlined at our web site in the comments box. Call the Golf Shop at 475-4653 to order or click here to order online.